The Delphin Technology LogMessage data loggers are universal. Whatever the application – for slow or for high-speed acquisition – Delphin has a LogMessage version for any user requirements. ProfiSignal Go software to enable professional evaluation of online and offline data. LogMessage devices function intuitively making it easy to configure inputs, to save data, and to display data as trends. LogMessage devices are designed for permanent operation and can be depended on to perform reliably over the long term. When data security and reliability are top priorities, users choose the "Made in Germany" logger. The LogMessage's data storage capability enables it to function without PC or network support. Software channels, configurable according to requirements, can be used for online calculation, monitoring, and many other functions. This enables data to be generated that is immediately usable. LogMessage devices are fully protected against earth loops enabling measurements from non-isolated sources. LogMessage devices are suitable for both slow- and high-speed measurements. Time resolution for analog measurement data is at 100-µs precision levels; digital resolution at millisecond precision. The devices are equipped for precision measurement with 24-Bit ADCs. LogMessage devices are equipped with internal web servers. The standard version displays current measurement data in a channel list as well as extensive configuration and maintenance information. LogMessage devices are available in nine different versions. The versions differ in the number of inputs and outputs. All versions are identical in respect of interface options, internal functions, galvanic isolation and data logger memory. LogMessage is available in nine different versions. LogMessage is a genuine high-speed logger with sampling rates of up to 10,000 measurements per second. The LM 5000 version has an increased isolation voltage of up to 650 VDC between inputs. 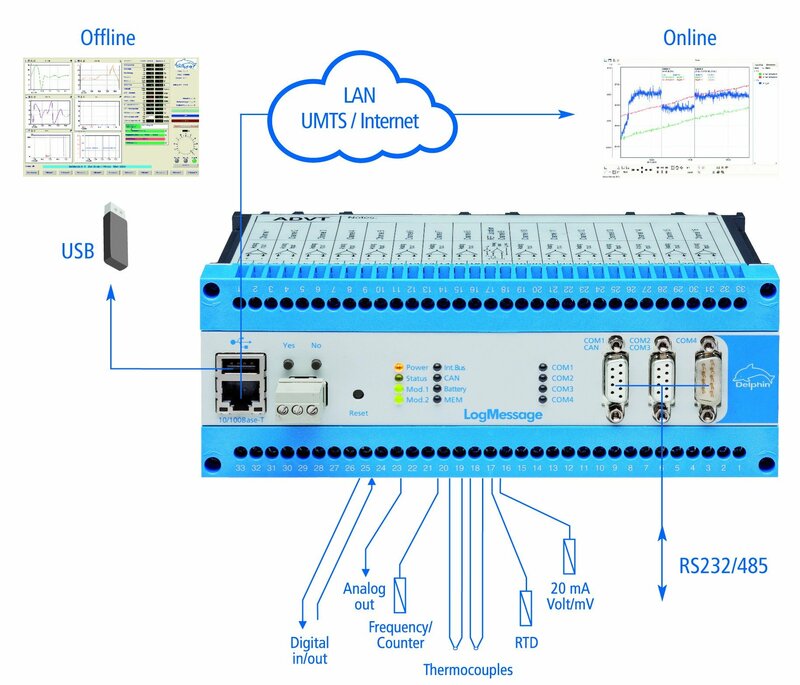 The LogMessage 1000 is equipped with 15 analog inputs and a sampling rate of up to 600 measurements per second. The inputs can be used for the data acquisition of mV, mA signals or any type of thermocouple. All inputs have differential and galvanic isolation. The LogMessage 2000 is equipped with 10 universal analog inputs, one analog output, 12 digital inputs (11 counters), and 17 digital outputs. The device has a range of internal monitoring and control functions to enable it to be used as a measurement data acquisition device as well as an inde- pendently operating system for control, automation or monitoring tasks. The LogMessage 3000 is equipped with 15 analog inputs (600 Hz sampling rate) and 24 synchronous digital inputs (with a time resolution of 1 msec). The device is particularly suited to fault analysis as well as to processing digital and analog events. The LogMessage 4000 is ideal for monitoring requirements. Any number of alarm and logic channels can be configured to the 8 analog inputs. Any of the 5 digital outputs can be switched irrespective of the current alarm situation. The LogMessage 6000 is equipped with more than 25 analog inputs. The device can be used for direct acquisition, monitoring and recording for any thermocouple or RTD sensor. The LogMessage 7000 can acquire measurements from up to 30 thermocouples. Configuration software is available to set channels to specific thermocouple types. The LogMessage 8000 is equipped with 15 analog inputs and 12 synchronous digital inputs. The device also has 16 digital outputs to control and manage alarms and events. The LogMessage 9000 is equipped with 20 analog inputs, 2 analog outputs and 2 digital outputs. The device has an over- all sampling rate of up to 1200 measurements per second and can directly acquire, monitor and record data from any thermocouple or RTD sensor.